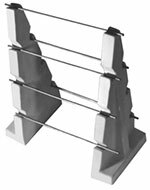 Orton’s tile setters hold tile and plates in a vertical position; used in pairs and holds seven plates or tiles. Great for applying decals and decorating. Tested by Orton to cone 6. Nest for easy storage when not in use. 7” long. Sold only in a pair. Bead rack for macramé beads. Rods are 10” long; rack ends are 8” high x 4” wide. Good to cone 6. Six rods total. Unique plate rack allows for stacking 4-6 high, depending on your form. Set of 3.